Blurb: For the second time in his short life, fourteen-year-old Teddy Clock has survived a massacre. Orphaned once more when his foster family is murdered, the traumatized teenager has nowhere to turn – until the Boston PD puts Detective Jane Rizzoli on the case. Jane spirits Teddy to the exclusive Evensong boarding school, a sanctuary where young victims of violent crime learn vital skills of survival. But even behind locked gates, Jane fears that Evensong’s benefactors aren’t the only ones watching. And when she learns of two other students whose pasts bear a shocking resemblance to Teddy’s, it becomes chillingly clear that a circling predator has more than one victim in mind. Joining forces with medical examiner Maura Isles, Jane races to stop an obsessed killer’s twisted quest – before an unspeakable secret dooms the children’s fate. 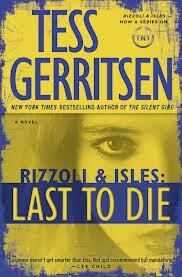 Review: This is the 10th book in the Rizzoli and Isles series. And I couldn’t help myself from comparing it to the TNT television series. The books and TV show are nothing alike. And having just watched all of the summer season, it was still fresh in my mind and that’s why I couldn’t help but compare them. I’m not saying that if you like one you won’t like the other, but just know that they are very different and you can’t really compare them. Overall I thought this was a pretty decent installment in the series. But I couldn’t help but wonder how much longer Ms. Gerritsen will continue with this series. You finish this book with a big question mark, one of the characters appears to want a change in scenery … what will that do to the series? Most of this book is set at Evensong, a private boarding school. I thought that it was a neat setting. Julian is back in this book and is very prominent in the plot line. That was fun seeing Maura and Julian back together. The Mephisto Club was also mentioned again. There was a slight twist at the end that I wasn’t entirely anticipating. Part of it I was, the other part not so much. I can’t say much more than that without getting into spoiler territory.